I left my office after working half day, on an Uber cab towards Madiwala. 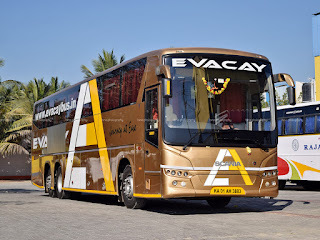 Evacay, interestingly, starts its service from Madiwala Market, instead of from the city. This meant a long travel to get into my bus. I reached the pick-up point by around 1325hrs - over 30 minutes to go for departure. I headed to a nearby restaurant for lunch, and returned to my pick-up point by 1345hrs - and my bus was already parked at the pick-up point. I received a message from the operator with details of the bus as I was nearing the bus - KA-01-AH-3883 was taking me to Coimbatore that afternoon. Boarding was swift - the crew were polite, and were following up with passengers who were yet to board. The bus got moving exactly at 1400hrs - the scheduled departure time. My seat was partially covered by the operator's logo - I had just a small uncovered area left to be in touch with the outside world. We stopped again at Silk Board for the next pick-up. This halt was a couple of minutes late, and we got moving only by 1409hrs. We took the elevated highway, and make swift progress towards Electronic City. The toll gate was in a mess - the queue of vehicles had extended well towards the descending ramp of the elevated highway. We picked up more passengers past the toll gate, and got moving by 1423hrs. We picked more passengers from Bommasandra (1429hrs) and continued rushing towards Hosur. Interestingly, the motor vehicles check post at Zuzuwadi (just past the Karnataka-Tamil Nadu border) was deserted, and we passed through without hassles. We went below the Hosur flyover to pick-up passengers - this halt was a few minutes long, and we got moving by 1453hrs. A movie was being played in the bus - and I was glued to it for most of the time. The bus pulled in to Sre Saravana Bhavan 'Classic' near Krishnagiri for break, by 1524hrs - I remained outside the bus during the break. The break was fairly quick, and we got moving by 1546hrs. The driver let the beast stretch a bit as we returned to the highway - the bus remained in the range of 95-100kmph for most part of the ride thereafter. The screens were turned off after the movie finished. I tried dozing off for a while, but couldn't. I had to finally resort to watching a movie on my phone. We pulled stopped on Salem bypass to drop (and pick-up) passengers - we got moving from here by 1737hrs - 3 hours and 37 minutes from Madiwala to Salem, including a 22 minute break - not really bad considering the fact that the traffic on the road was fairly high. We stopped for another break, just past Vaigundam toll gate - at a bakery (1806hrs). The place was quite big - had toilets as well. Was a well deserved break - but it took a little longer than actually required. We got moving only by 1822hrs - 16 minutes long. I dozed off briefly after the break. I woke up just as the lights were turned on - we had turned off the highway to drop passengers at Avinashi. A few passengers got off, and we continued our journey (1932hrs). The progress was swift, and we turned off the highway towards Coimbatore city at 1957hrs. Progress slowed as we entered city limits. Passengers got off at frequent intervals, and the bus finally closed its trip at Gandhipuram, near the bus station, at 2025hrs - 25 minutes late. Remarks: The bus, KA-01-AH-3883, had clocked a little over 4.02 Lakh kms. The overall maintenance of the bus was great - there were no scars on the body, but it did have a big patch work on both sides - but was done neatly. The crew were great - very polite and well spoken. The bus departed perfectly on time, but ended up 25 minutes late at the destination - we took two break, one of 22 minutes and one of 16 minutes. The ride quality was terrible - a very common feature of the Scanias, especially of the 13.7M coaches. Evacay charges the highest on almost all its services, and still manages to fill quickly - they've been doing great on all their services - both it terms of service quality and in terms of timings! Overall a great trip. I look forward to my next trip on Evacay! Charging Point: Available, and worked well. Entertainment: Available, one movie played. Will I take this service again? The best choice on the route - Obviously, Yes! 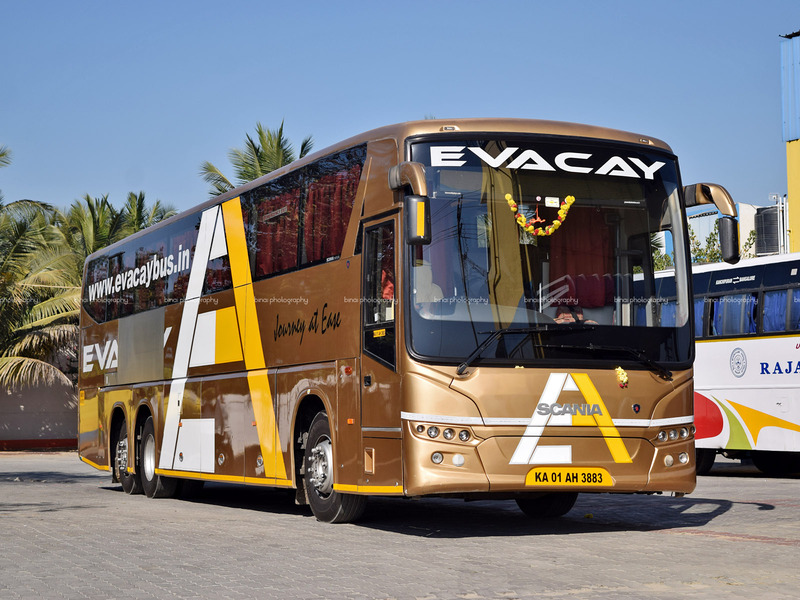 As you mentioned, Evacay appears to be the latest sensation on this route despite higher costs. After my good experiences on the chennai route, I recommended it to my friend, who has now shifted loyalty to Evacay in this route. His family goes to the extent changing travel time just to take Evacay. The fact that they are doing well despite higher rates in comparison with other popular operators is a testimony for their success. Interestingly, they are one of the economical operators on the chennai route even on weekends and they seem to get good loads on weekdays as well.